In a lawsuit filed today by the ACLU of Washington, Bertha Aranda Glatt, a lifelong Pasco resident, challenges the City of Pasco’s at-large election system for violating the Voting Rights Act by unlawfully diluting the vote of Latinos in City Council elections. The lawsuit claims Pasco’s election system violates Section 2 of the Voting Rights Act because it impermissibly dilutes the Latino vote, deprives Latinos of an equal opportunity to elect representatives of their choice, and does not allow the city’s Latino residents to participate equally in the political process. Although five candidates are nominated in districts and two candidates are nominated at-large in the primary election, all members of the Pasco City Council are elected at-large in the November election, i.e. every voter in the city casts their vote for each council member whether or not they live in the council member’s district. Because of racially polarized bloc voting patterns, the at-large election system impermissibly dilutes the Latino community’s voting power. It does so by requiring a candidate to win the majority of all Pasco voters in order to win a seat on the Council, which has proven impossible for the Latino community to do. Although Latino residents comprise 54% of Pasco’s population, Latinos comprise approximately 32% of its voting-age population. However, because of racially polarized bloc voting, even though a Latino/a has run for a City Council position nearly every election cycle since 1990, no Latino candidate has ever won a contested election for a seat on the City Council. The suit points out that polarized voting patterns in at-large elections in Pasco have allowed elected officials to remain unresponsive to the needs of the city’s Latino community without fear of consequence at the polls. The lawsuit was filed in the U.S. District Court for Eastern Washington. “The Latino community is a significant portion of the city’s population, yet their interests are not adequately represented on the Pasco City Council. 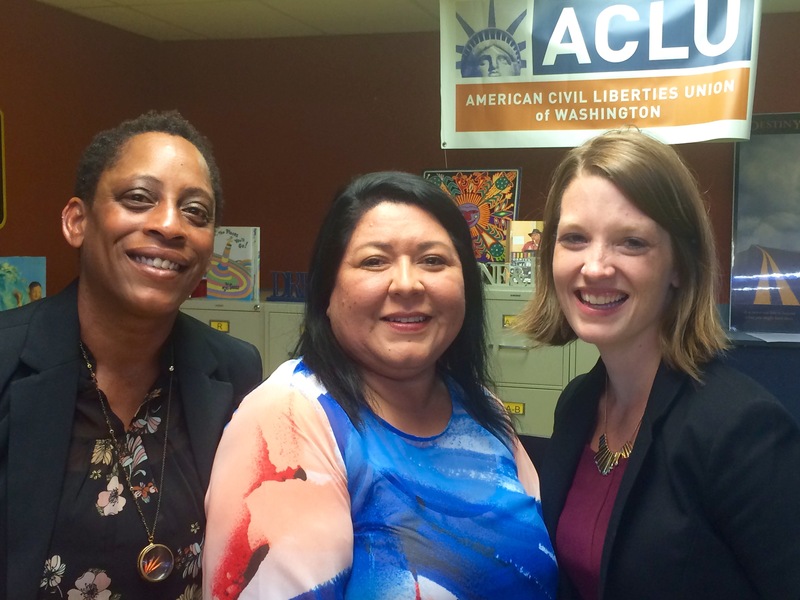 All voices of the community need to be represented on the city council,” said ACLU-WA Staff Attorney La Rond Baker. The suit seeks to change Pasco’s City Council election system to seven single-member districts, similar to the election system adopted in Yakima in response to an ACLU-WA voting rights suit (Montes v. City of Yakima). ”The ACLU believes that a system in which all seven seats are elected on a district basis is the best way to bring Pasco into compliance with the law and ensure that the Latino population’s vote is meaningful in City Council elections,” said ACLU-WA Staff Attorney Breanne Schuster. In 2014, a federal district court found that that the City of Yakima’s at-large voting system for city council elections, which is similar to Pasco’s election system, violated the Voting Rights Act because it impermissibly diluted the vote of the city’s Latino community. To remedy this violation the court adopted the ACLU’s proposed seven single-member district election system. In the November 2015 elections held under the new system, three Latinas were elected to the Yakima City Council – the first time any Latino candidates had been elected to Yakima’s council. Representing the plaintiffs are ACLU-WA staff attorneys Emily Chiang, La Rond Baker, and Breanne Schuster: and ACLU-WA cooperating attorney Brendan V. Monahan of Stokes Lawrence Velikanje Moore & Shore.